It seems that Crickets really are the new 'it' food. They are cropping up in a lot of PR emails and so far I've been saying yes! This latest idea is their inclusion as cricket flour for protein in a cereal bar - they make up 5% of the bar. 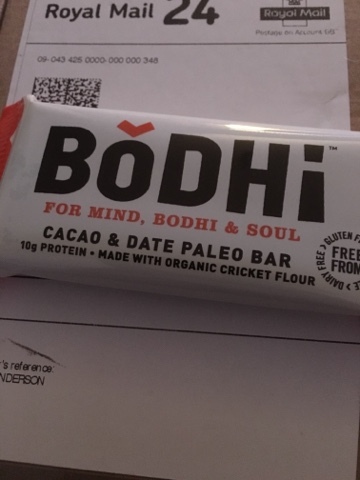 Bodhi is a noble concept - mix things we know and love into a bar and then add crickets for a bit more oomph. The problem with this is the same as the pasta - there is a massive psychological barrier to eating insects. The most keen people to try the bar had missed the explanation part and gone straight to the munching. Indeed some people spat it out or changed their minds when they found out. The bar has a very dry texture and is very much for those who love dates. The cacao isn't such a strong flavour. The main complaint from people was that it's a very dry bar. I think if you were up a mountain and had a bar and some water to keep you going then that may be ok. I couldn't eat more than a third of a bar even with a drink - but I think my final bite fell foul of the mix of the bar. Usually I love it when each bite tastes different due to an uneven mix, here I got a bite that tasted far too crickety and really put me off. Usually I'd munch away while reviewing but I just couldn't bring myself to try more today. It's a decently deluxe proposition, the packaging and portion are both premium but I'm not sure this combination works for me - you can't add a sauce and there is no hiding from the fact that without a drink this feels like a challenge not a snack. I'd be interested in other versions of this kind of thing, but as it stands people were happy to have one bite to try it but not interested in a second.